1921 - Penzance Ivy Leaf Club (British Legion) Market House Buildings, Penzance. 1922 - EARL HAIG STARTS CAMPAIGN. 1922 - Anual Meeting at the Ivy Leaf Club Market House Buildings, Penzance. 1922 - War Memorial 14 May 1922 Penzance at Battery Rocks. 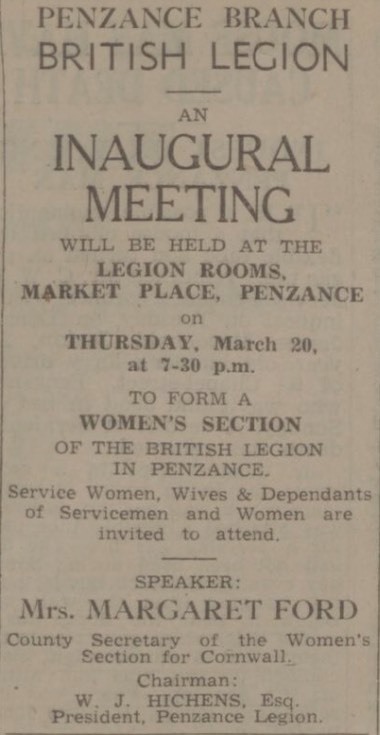 1923 - PENZANCE BRITISH LEGION ANNUAL MEETING. 1923 - REMEMBRANCE DAY, correct time and place. 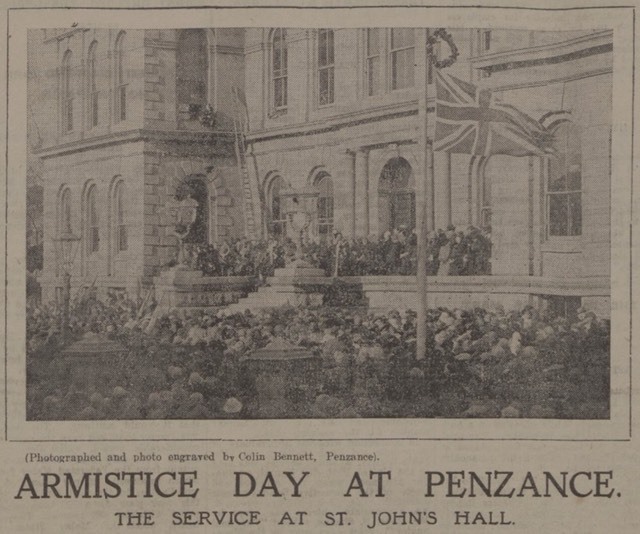 1934 - New Club House Penzance British Legion at Chapel Street, Penzance. 1934 - November M. J. KENNA, Vice-chairman. J. I. ROBERTS, Hon. Secretary. 1935 - JUBILEE BATHING POOL opens next to War Memorial. 1940 - WREATHS LAID AT WAR MEMORIAL. 1943 - W.J Hichens, Chairman. A. C. Goddard, Hon Secretary, 18 Chapel-Street. 1946 - MARY HAMLIN at Legion Concert in St. John’s Hall Penzance. 1947 - Women’s Section hoping to add its name to the list of 60 branches. 1947 - ONE OF PREMIER CORNISH UNITS. We are living in difficult days. 1948 - Mr F. G. Turner after 25 years as Treasurer, both Club and Branch dies. 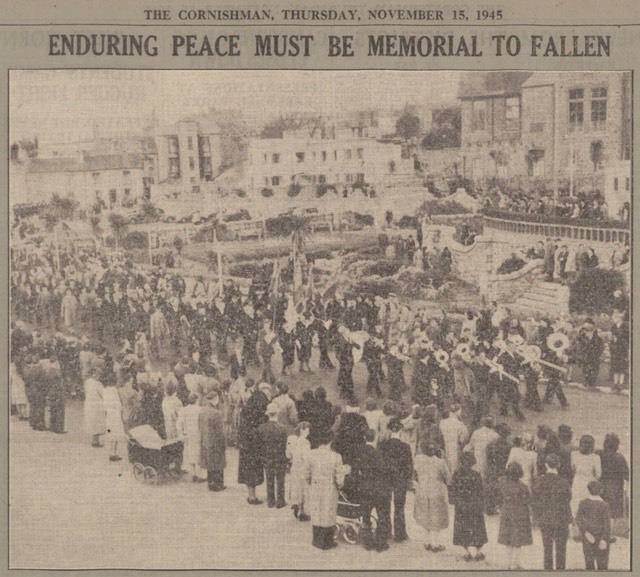 1953 - Coronation Day Penzance joins in. 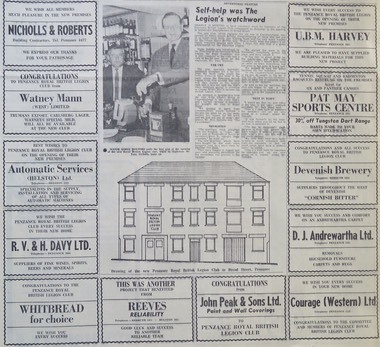 1960 - Early 1960’s moved to premisses in Causewayhead.